This volume of writing prompts contains 25 Six-Word “Stories”. 1. Knowing and showing trump selling and telling. 2. Value listening much more than speaking. 3. Influence your circle, then expand it. Each “story” shares a powerful “lesson learned” as a critical thinking exercise that challenges students to consider the world and their place in it. 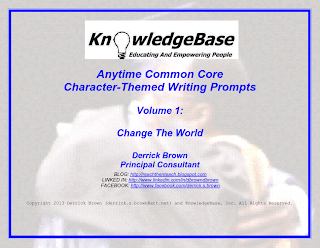 The prompts are aligned to several Common Core College and Career Readiness Anchor Standards for Writing (CCSS.ELA-Literacy.CCRA.W.1-6). Augment the prompts with your own personal thesis questions, and assign them to your students! 1. During the last month of the school year, to impart wisdom as students prepare to say “goodbye” and advance to the next grade. 2. As prompts for student-delivered commencement (and other school assembly) addresses. 3. As daily writing prompts, themed journal entries, or 500-word essays!